You can import customers, billing information and credit card numbers from any payment gateway supported by PayWhirl. If you would like to migrate to PayWhirl from another payment platform, and have existing customers in one of our supported payment gateways, you can import them with a few clicks from within the gateway settings page in your account. 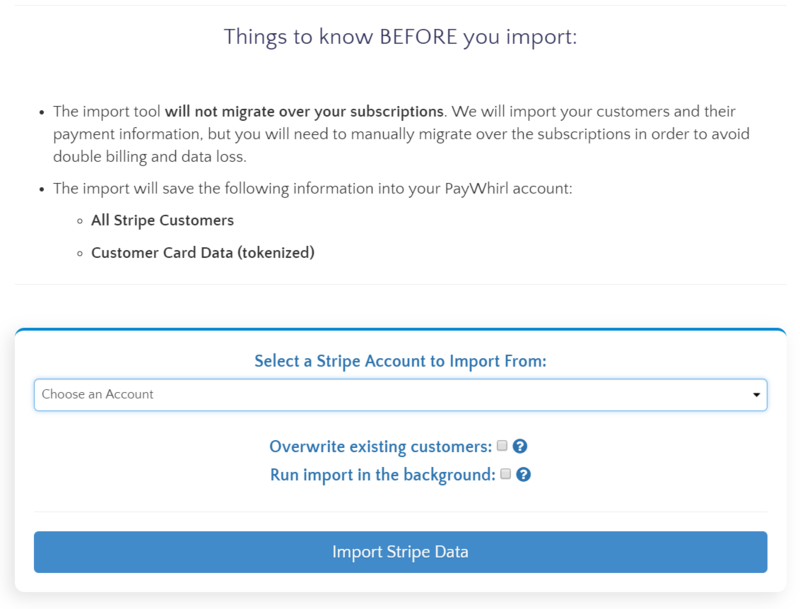 Once you have connected your PayWhirl account to the same gateway your existing customers are in you can use the import link on the gateway settings page in PayWhirl to import all of your customer information. If you are importing a lot of customers make sure to click the 'run import in the background' checkbox. After you've finished importing your customers into PayWhirl you can "map" your customers to existing payment plans in your account using their imported payment methods. Note: We are only able to pull in information that is saved in the Stripe Account through this method. Sometimes it is the customer's billing info instead of shipping info that is imported into the account. If you are migrating over from another recurring payments system, you may want to export your customer's shipping information and use our import tool to fill in the missing info. If you go to the Manage Customer's page you can upload a csv with the correct info to update it. You can also click 'edit' and update their information manually. A sample import file can be used as a guide to format the import correctly. If all your customers bill on the same day of the moth it's relatively easy to match prior billing scheduled because you can just use a billing cycle start date on the plan that you will be subscribing customers to in PayWhirl. This will make sure all START billing on the specific day of the month you'd like. However, if your existing customers all bill on different days of the month and you'd like to keep them billing on the same days they billed prior to the migration, you will need to be careful to change the billing cycle start date on your plan as you go through your subscriptions. Repeat as necessary for all the different days your customers bill. Import your customers using the gateway settings page in PayWhirl after you've connected to the gateway with your customers. Update your customers with any additional information through the customer import tool. Map your imported customers to NEW plans in the system with the correct billing cycle start date set as you are doing the migration to ensure customers are billed on the correct day(s) of the month going forward. You will also want to be careful about EMAILS that are sent when you subscribe customers to plans. You might want to disable one or more of the emails during the migration to make sure that customers are not notified of changes, etc. 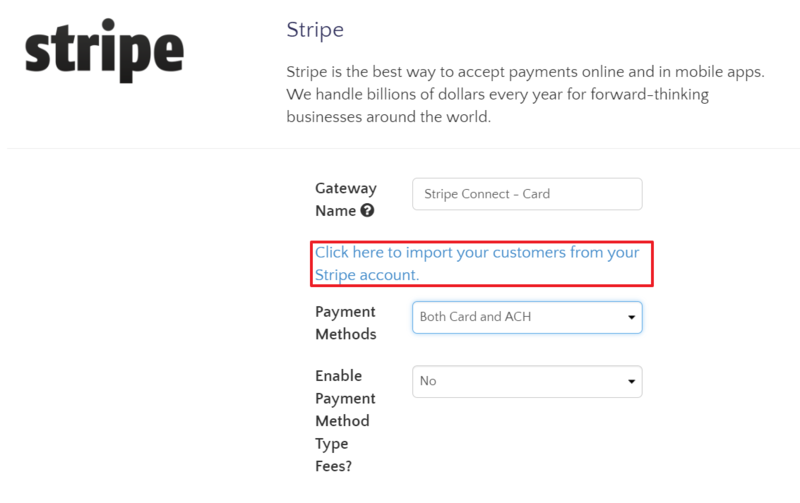 Note: If you are a current client and switching payment gateways (say from Stripe to Authorize.net) you can now use the 'overwrite existing customers' option. This will import the clients from the new gateway and will keep all of the rest of their data so you won't have to resubscribe them. Please let us know if you have any questions about migrating to PayWhirl from other payment systems, we're here to help!